Shagbark hickory is probably the most distinctive of all the hickories because of its loose-plated bark. 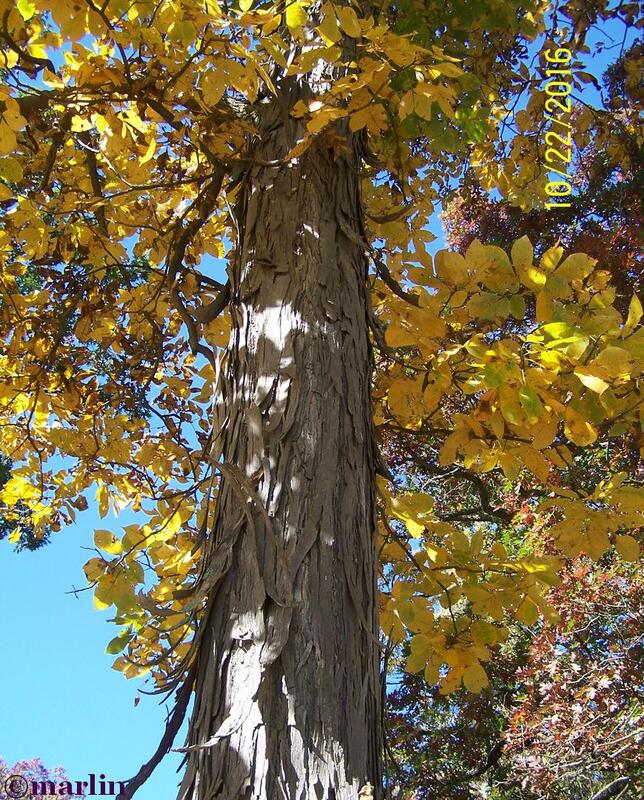 Common names include shellbark hickory, scalybark hickory, shagbark, and upland hickory. Shagbark is evenly distributed throughout the Eastern States and, together with pignut hickory, furnishes the bulk of the commercial hickory. The tough resilient properties of the wood make it suitable for products subject to impact and stress. The sweet nuts, once a staple food for American Indians, provide food for wildlife. 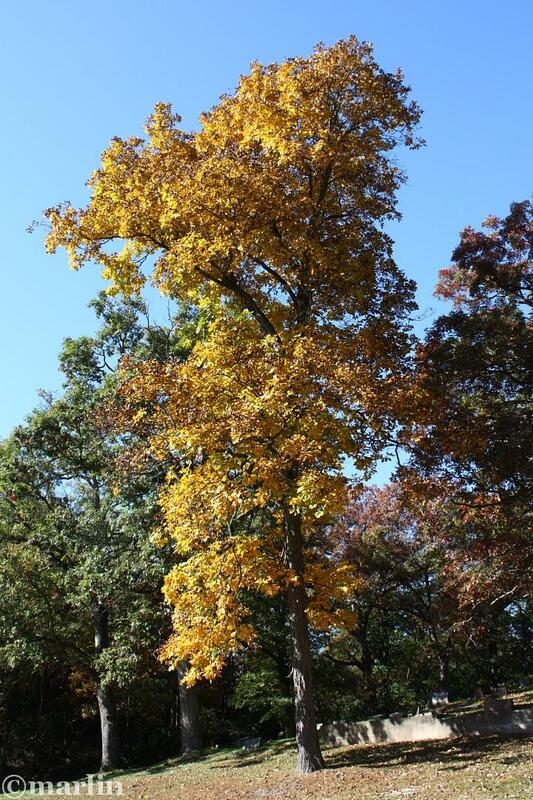 This 80-foot shagbark at Oregon, Illinois is resplendent in its fall butter-yellow foliage, a wonder to behold on a sunny say with a blue sky. There is something about standing under a yellow tree looking up at a blue sky. . . all I can say is, god has good taste in colors. Shagbark hickory grows well in both dry and wet soil conditions, but prefers well-drained soils such as those found here, on a bluff overlooking the West Branch of the DuPage River in Northern Illinois. This bluff is the site of a Late Woodland period aboriginal settlement responsible for the effigy burial mounds at Winfield, Illinois. Hickory has traditionally been very popular as a fuel wood and as a charcoal-producing wood. The general low percentage of hickory in the overstory of many privately owned woodlots is due in part to selective cutting of the hickory for fuel wood. Hickory fuel wood has a high heat value, burns evenly, and produces long-lasting steady heat; the charcoal gives food a hickory-smoked flavor. The wood of the true hickories is known for its strength, and no commercial species of wood is equal to it in combined strength, toughness, hardness, and stiffness. Hickory is used for furniture, flooring, and tool handles. The combined strength, hardness, and shock resistance make it suitable for many specialty products such as ladder rungs, dowels, and gymnastics equipment.